Now to the new and improved bike course at Ballarat. Yes there have been some changes to last years course, and I think they will add to the experience and the importantly your average speed. Michael Raelert in the lead on the bike in 2014. 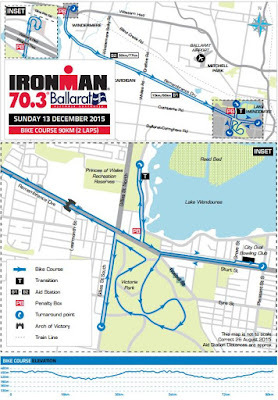 ﻿Last year at the start of each lap there was a 9km out and back section around Lake Wendouree. The road around the lake has a number of roundabouts which made for a slower start for competitors. This year that slower section has been dropped and instead competitors will head straight out and then left onto Sturt St for a flat fast out and back ride to the Bowls Club prior to entering the shaded Victoria Park Circuit, which was part of last years course. At Ballarat in 2014 Michael Raelert and Luke Bell were the pros off the front setting the pace with 2:08hrs and 2:10hrs bike splits. Compare this to Mandurah where Raelert and Bell both went around 2:00hrs on the bike. This can be put down to last years conditions which weren't conducive to fast times with a wind blowing and a damp road, but more on that shortly. The Victoria Park Circuit section has slightly narrower roads than the rest of the course with some turns. This will see athletes in and out of the saddle with changeable pace. A Tip for competitors: be careful on your change of pace through this part of the course, keep your accelerations moderate and try to maintain your speed through the corners. The circuit is well protected from the elements and helps to break up the ride compared to the other long straight sections of the course. Lake Burrumbeet. The road is gradually down hill all the way to the far turn, so its likely to be faster on the way out. Sticking to your pre-arranged race pace strategy and not getting to excited on fresh legs will be vital here. The Wind generally blows S/SE along this road so you will either have a cross tail helping you or as in last years case a cross wind. It was quite strong last year and if there is wind, you will be open to the elements along Remembrance Drive. The return to finish the first lap will definitely be harder for competitors, so be conservative early on with your power. The wind if any won't be helping and it's slightly uphill all the way back to town so keep this in mind when setting your plans. 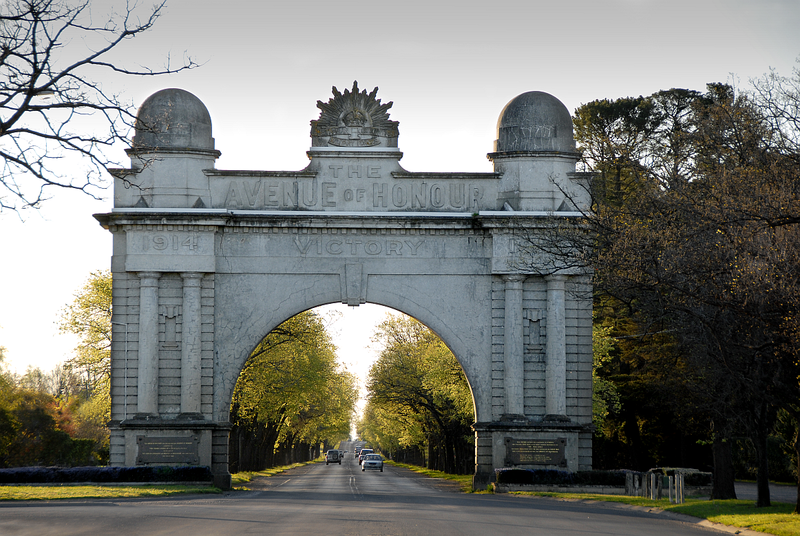 Once you are back in town, its a left turn onto Wendouree Parade for 1km, then out onto the second lap. In Summary, I think if we are blessed with good conditions this can be a fast course suitable for all levels of rider. The course changes that have been made by IRONMAN will make for a better competitor experience and it will be more spectator friendly with most of the ride in and around one section of road. ﻿ For our first time competitors at Ballarat, please go in with a plan. The two main things you need to consider are your pacing and nutritional/fluid strategies. With your pacing, set a power/heart rate range and stick to it, ride your own race and don't deviate from it. If anything aim for a slight negative split of intensity and remember the old adage, you ride for show and run for dough. Think about what you can hold pace wise and dial it back a few percent, so you come of the bike feeling strong and ready to run. With your nutrition, work out what are your energy and fluid requirements each hour and how you are going to intake them (Bars? Gels? Energy Drink? ) during the bike and stick with it. Small amounts often for even energy intake throughout.